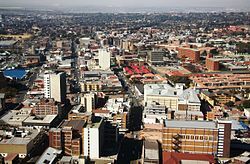 Germiston is a city in the East Rand of Gauteng in South Africa. Germiston is now the seat of the EkurhuleniMetropolitan Municipality which includes much of the East Rand, and is also considered part of Greater Johannesburg. It was established in the early days of the gold rush when two prospectors, John Jack from the farm of Germistonnear Glasgow and August Simmer from Vacha in Germany, struck paydirt on the farm of Elandsfontein. Both men made fortunes and the town sprang up next to the mine. In 1921 the world's largest gold refinery, the Rand Refinery, was established at Germiston. Seventy percent of the Western World's gold passes through this refinery. The WesBank Raceway motorsports facility was located in the city, but it was sold to industrial estate developers in November 2007. Germiston Stadium (formerly the Herman Immelman Stadium), home stadium of Moroka Swallows FC is also located in the city. The city has a number of historic buildings. Among these are the St Andrew's Presbyterian Church which was built in 1905, and St Boniface's Church designed by Sir Herbert Baker, which was built in 1910 (this is the second church on the site, as the Anglican Parish was founded in 1897). The church also houses the historic 1910 English Romantic Norman and Beard Organ. The Alexander Hotel was also partly designed by Baker, using his traditional stone appearance, although this building has been allowed to decay over the last twenty years, with the stonework having been painted over. There are a number of schools in the city, including the Dominican St Catherine's Convent, which was founded in the city centre in 1908, and then relocated to the suburb of Parkhill Gardens in the 1940s. Germiston High School was founded in 1917, alongside Victoria Lake. For a period of time from the 1940s to 1963, with the boys staying at Victoria Lake, and the girls moving to Fourth Avenue in Lambton. (1964 a co-ed school was formed to be known as Germiston High School.) Due to the need to relocate the Afrikaans Delville Primary School, the Girls were moved back to combine with the boys in the original historic buildings. (1964) Famous past pupils include Dr Sydney Brenner, winner of the 2002 Nobel Prize. The Germiston Boys High Cadet band was known throughout South Africa as one of the greatest School Cadet Bands ever to march onto the streets of South Africa to parade and or to participate in Competitions. This cadet band's record of achievement is unparalleled in the history of South Africa school cadet bands. This Band started its success from the years 1952 up to and including 1964. Often the band would record an average mark of 99 percent overall. (music drums, bugle, dress and marching). Victoria Lake is better known today simply as Germiston Lake, however, the famous Sailing and Rowing Club retains the name of the Victoria Lake Club. The club is home to some of the best canoeists and rowing crews in the country, including the sixteen time South African School Champions, St Benedict's College. The lake is very popular at weekends for water skiing and regattas. Germiston is also the location of Rand Airport, at one time one of the busiest in Africa and the Southern Hemisphere. Today it caters largely for light aircraft and flying schools, but is also home to the South African Airways Museum. As a result of this, two of the earlier Boeing 747 Jumbo Aircraft acquired by SAA now reside there on permanent display.